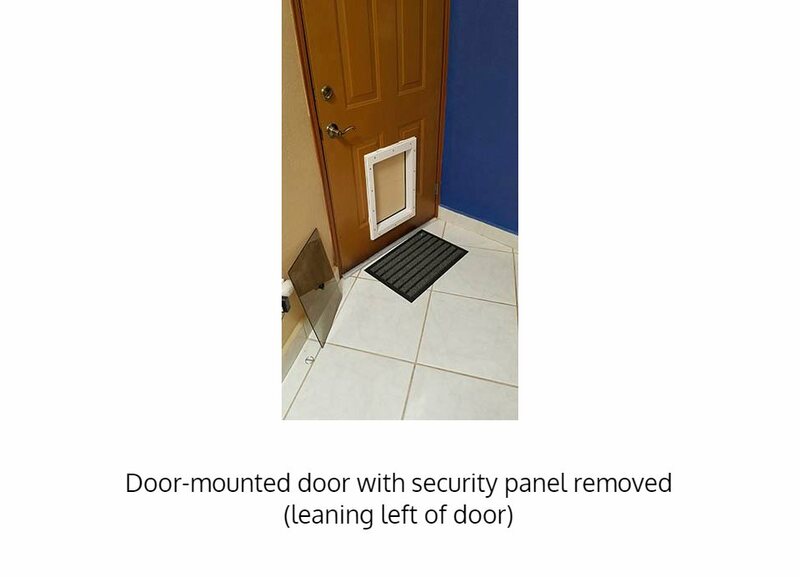 Size for your tallest dog – buy and mount the door for your tallest dog, and make accommodations to assist smaller pets (such as the Pet Step accessory). 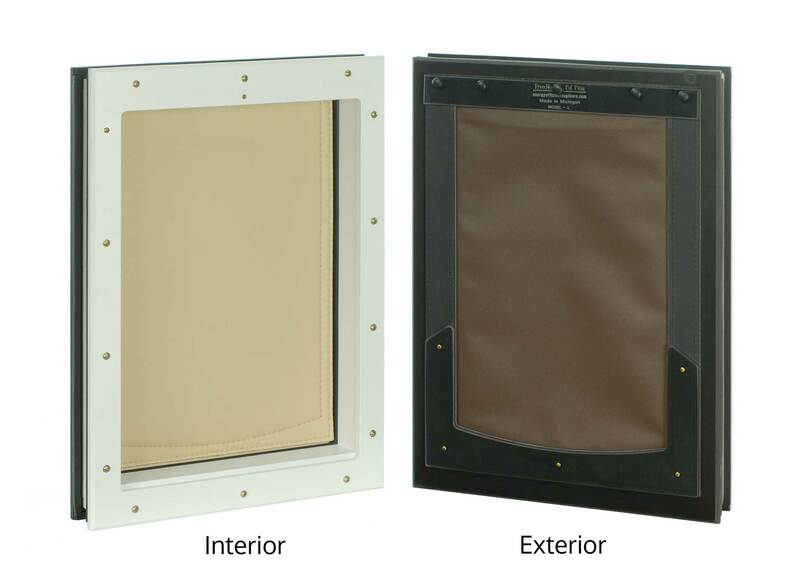 Rough Opening – The size of the hole in your door needed to accommodate the Freedom Pet Pass dog door. 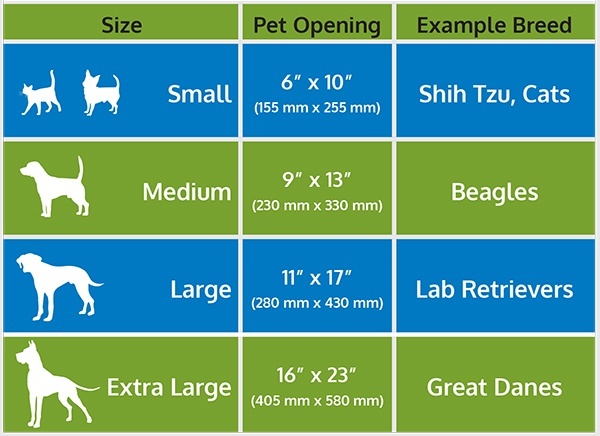 Frame Size – The overall size of the frame on the pet door; the footprint of the dog door on your human door. 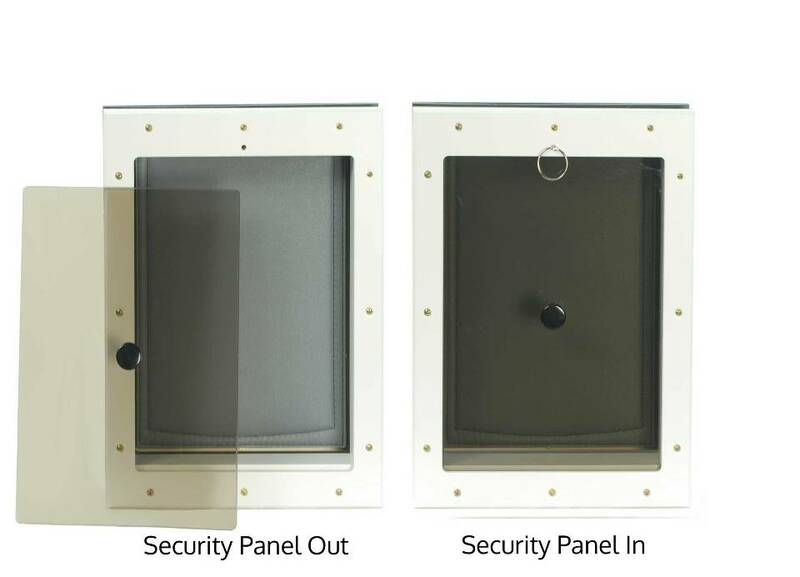 Installation of a Freedom Pet Pass door-mounted dog door is relatively fast and easy. Any DIYer with the right tools can do it, and it should be a snap for any professional. We recommend buying on https://freedompetpass.ca for pricing in Canadian dollars appropriate tax calculations. 5 star! First dog door was a small. Sold that house and buying the medium because we added a grand-pup that is larger than our fur baby. The door holds up so well with the blowing sand and high winds here in Texas. I have recommended this door to all my friends that are interested in dog doors. Superior quality worth the money. I would like to leave 1 of 2 reviews. 1 being my installation experience, 2 will be in the Spring after a Canadian Winter. For starters I was reluctant to spend the money, I read many a review and was convinced. 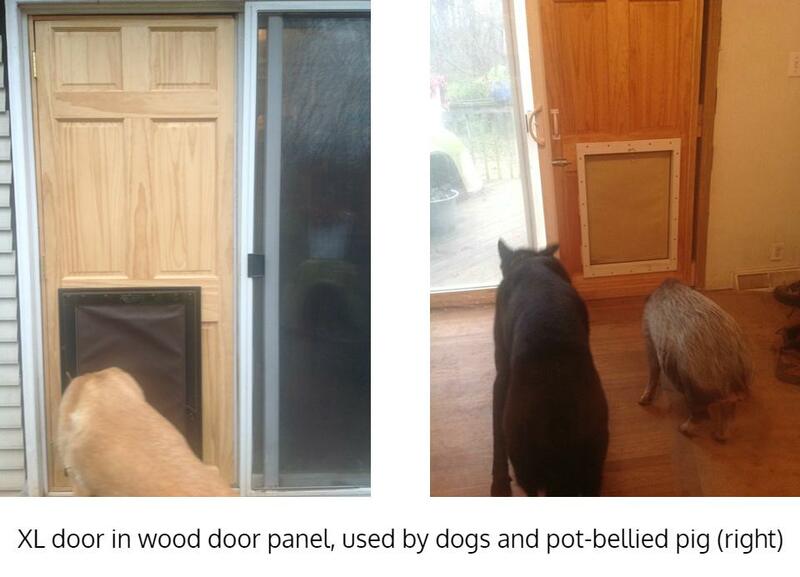 I was tired of “extreme weather pet doors” that snapped off when the temperature got to freezing. First off, I love the fact that these doors are made in North America! The construction, quality and design are amazing. So far I feel no cold weather coming in. I had a contractor put mine in, where I struggled is; I followed the instructions for dog size, and where to install the door according to dog height. Unfortunately I didn’t take into consideration one of my dogs arthritic back end. She didn’t have to bend her back, but half way through she cried and cried, she couldn’t lift up her back legs to get the rest of the way through. This door is larger then previous, but previous door was a lot lower, even though she bent her back. I was devastated and so upset with myself for not making allowances for her back end. I immediately built her a ramp on either side of the door and will adjust the doggy door lower in the spring for her. Please consider your pets health when installing. I bought this door almost 5 years ago. I live in northen canada and -30°c or colder is queit common during the winter months. I wanted something that would keep the cold out and the heat in. It works great. Even when the wind howels out side, it doesnt let the cold in. I have had no problems with any of the parts or seal. Me and my bulldogs love this door. We have had this door for the past two years for our two Shia Inu dogs and it works perfectly. We are in the process of moving to a new home and one of the first things on our list is to order another Freedom Pet Pass door. I have a German Shorthaired Pointer that used to stand on her hind feet and open the door on her own. While I thought it was cool that she taught herself to do that she never closed it behind her. I tried to train her to close it but it didn't work. It wasn't a big problem in the spring and fall but in the winter and summer it was a little taxing on the HVAC system. I got another puppy and realized that I really needed a dog door. I got the large door mount door and the installation was a quick and easy. It took a little while for them to learn to use it but now I don't know how I lived without it. I will say that when Gunner was a puppy he took things outside that I really didn't want out in the snow... A queen size comforter comes to mind... and he tried to take the sofa cushions out but they got stuck in the door. That was the only time that I can say the door didn't seal but that wasn't the fault of the door. Gunner will turn 3 in July and we installed the door in the fall the year he was a puppy. Best money I ever spent. If I ever move I will either take my door with me or buy another one. 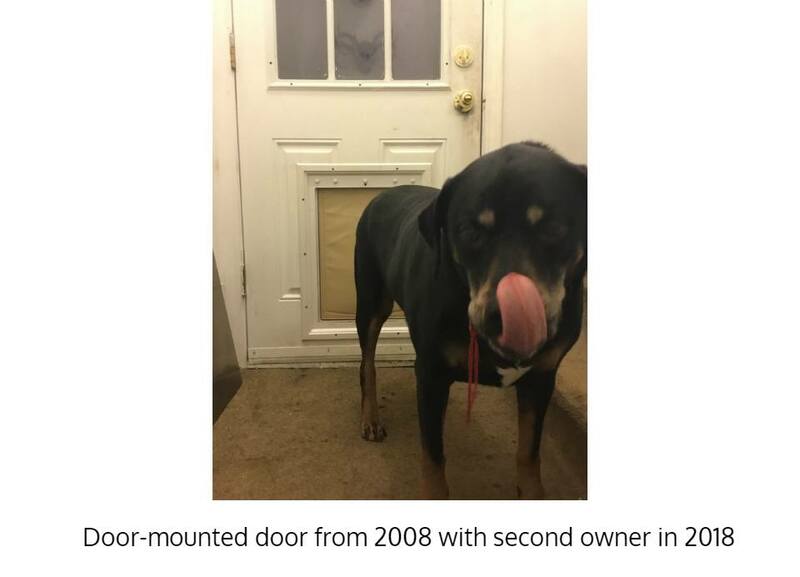 The dog door seals better than the people door in which it is mounted. I've had it a little over a year now and couldn't be happier with it so far. I was reluctant at first because of the price but it was well worth the cost. We had a super cold winter last year and the door had a tight seal, I have to smile every time I hear it snap shut !! Now I have peace of mind that the girls can come and go as they please while I'm working 12 hour shifts. The only down side is I get extra dirty paw prints on the floor now ! Thanks for making this door. 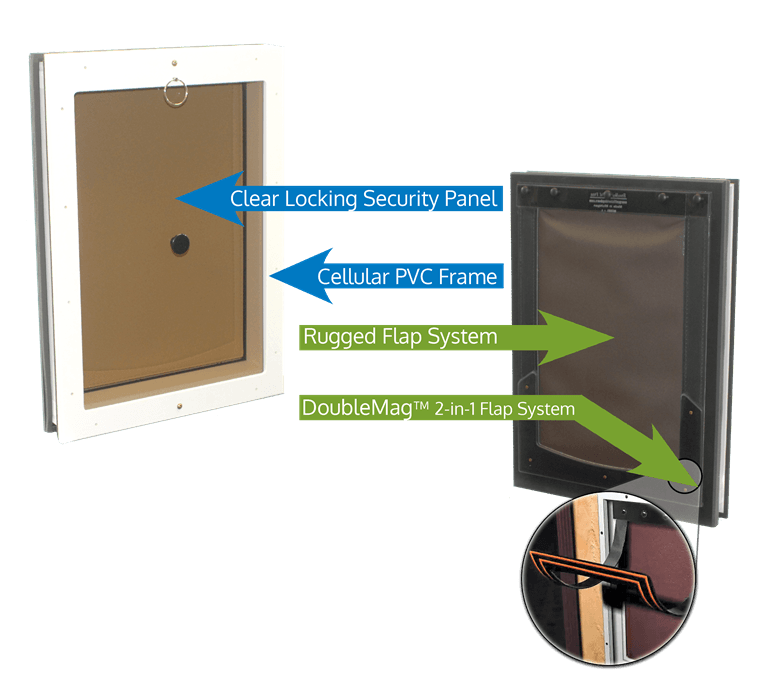 First of I want to thank you for selling such a wonderful quality product, We live in Northern Canada and your dog door is a exactly what you said it would be .......EFFICIENT! Dog loves it and so do we! 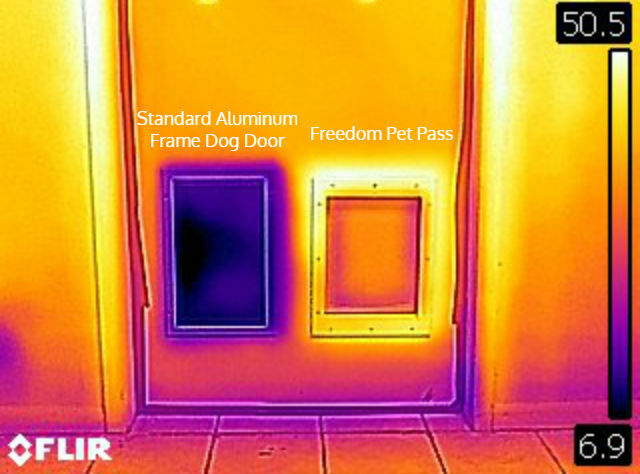 We have had the medium Freedom Pass pet door for 3 years now. 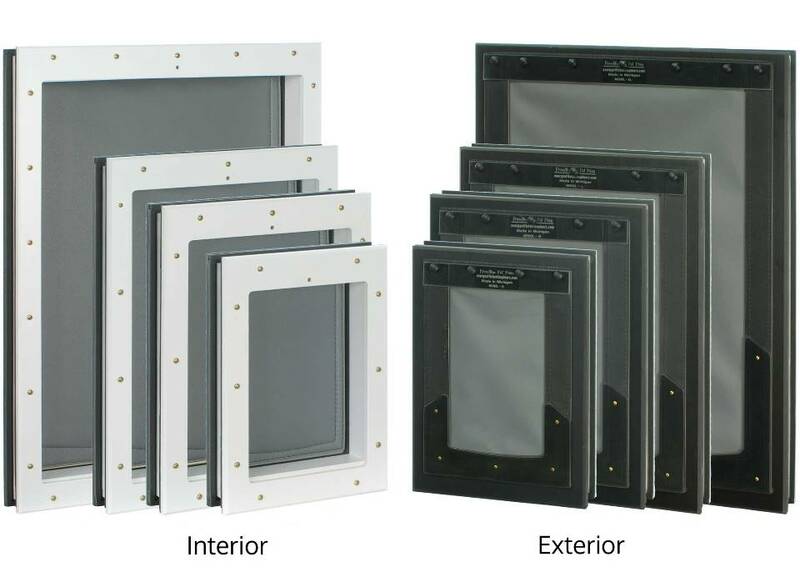 After hours of research, we decided to go with Freedom Pass because of the airtight seal. I have two basset hounds who go in and out throughout the day and night. They and my husband and I LOVE this door!!!!! I cannot say enough good things about it. The seal is still good after 3 years. I do occasionally (maybe once every 3 months) clean the magnets and the door which is super easy to do just to remove any grime and keep it looking nice. no drafts, no bugs and no critters. The door is located directly to the left of my office desk (I work from home) and I can honestly say through the winter, there is absolutely NO draft from that door! Don't waste your time and money with any other door!!! I thought the door was rather expensive but it was worth every penny. It is very, very well built. Almost no air leakage. Dogs LOVE it. Could not be happier with it. 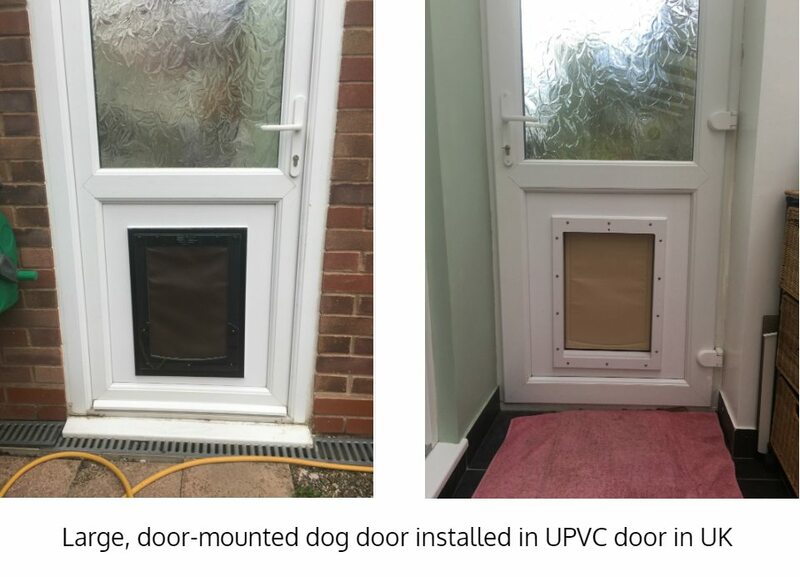 Thanks very much for the excellent dog door we ordered from you. We installed it as directed in the back door of our newly built home, and it has done a superlative job as the cold weather set in. We haven't had a hint of draft so far, and our Welsh Springer Spaniel Bryce moves in and out with ease. Great product, performing as advertised. Nice work! I was searching for Dog door for long time, I got one that was nothing but a piece of plastic… then came across the Freedom pet pass door. The price was much higher than many of the other door but they promised different level of quality which I'm sooooo glad i trusted. From the first contact all was seamless. I got immediate replies from Don very personal, informative amazing service which i fined very rare even when living in one of the most service oriented countries in the world -Japan. I myself ,a travel agent, and in the service business was very impressed with Don and his way that i dedicated one of my team meeting to his replies as an example of how service should be at it's best. The door works so well that i could not ask for better. even a small issue due to my wrong installation( Which by the way is also a very easy process) was solved with the kind advice of Don. The service and the product itself simply worth every dollar spent on and Don and his team makes sure the whole experience is smooth and veeeery pleasant- real pleasure !!! and I'm very happy i was not tempted for any other door compromise. Have a large unit for my "small" 75 lb. huskie and 2 malamutes, one that is over 170 lb. They are in and out all day. After 3 years of abuse, I think I need to buy the replacement flap and seal. Despite the fact they pull one side of the seal off from time to time, it is a easy repair to reattach. Very durable and excellent seal. Have had competitor's product and I think this one is the best. Worth the extra money in the long run. 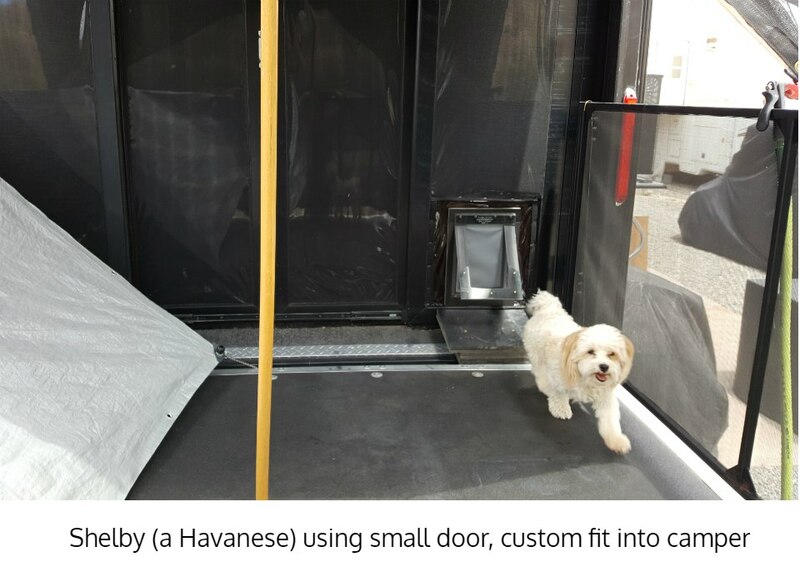 I have had a medium door mounted dog door for the last 2 years and it is icredible compared to the other dog doors I have used. I am about to buy a second one. This is the ultimate pet door and worth every cent. It's never opened under high winds or let in any rain or snow. It's super easy to install and looks good. It's the only door that should be considered and it will be the last you'll need to install. Great work, guys and thanks a bunch. I've owned this door for 4 years and can say with confidence that buying it was the correct choice. 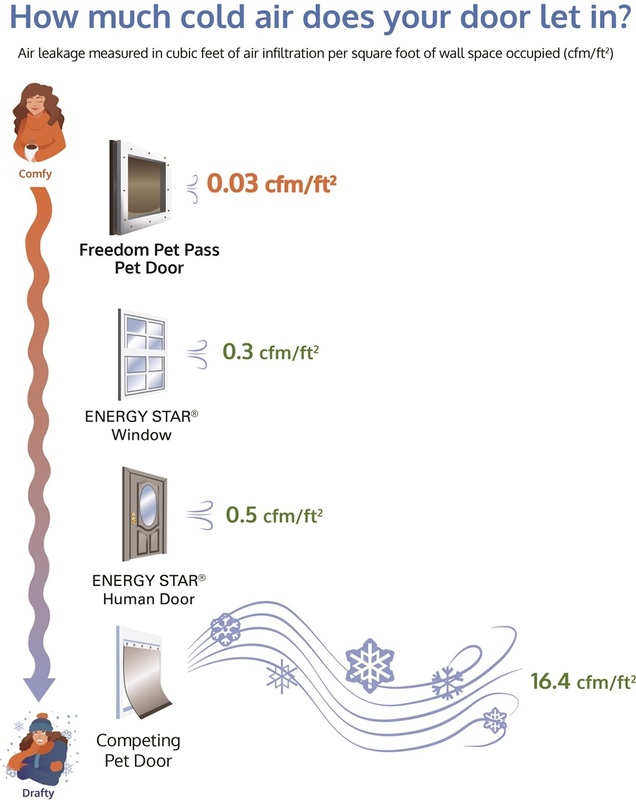 When you look at the different designs out there it's really the only reasonable choice if you care about energy efficiency. They have that video with the fan and I would say that it is every bit as air tight as they advertise. I have a jack russell and a 90 pound pit/boxer mix and they both barrel through it at top speed several times a day. It is showing signs of wear after 4 years of this, but over all it's held up pretty well. I've had to contact the manufacturer twice regarding issues with the door and both times they exceeded my expectations with their service. Greetings from Russia! Thank you very much for nice product and service. The door is already installed and dog is using it right away. Your door replaced the original door and we removed the Larson Storm Door. The Mud room instantly increased in Temp and the drafts are now gone.